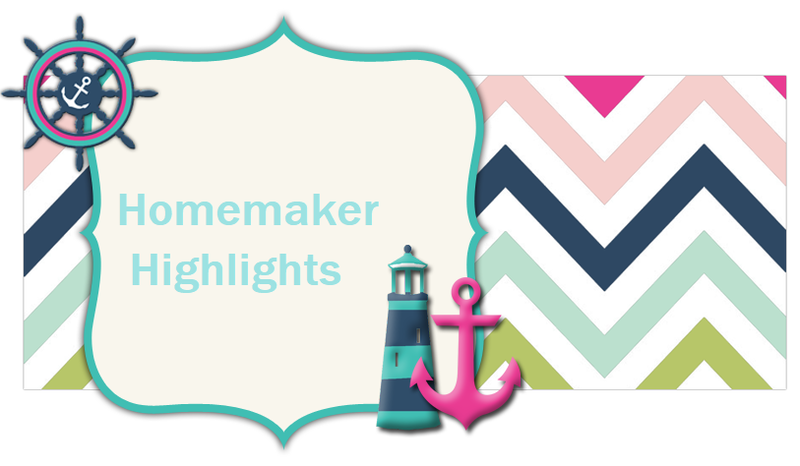 Homemaker Highlights: Missha Crystal Style Nail Polish giveaway. 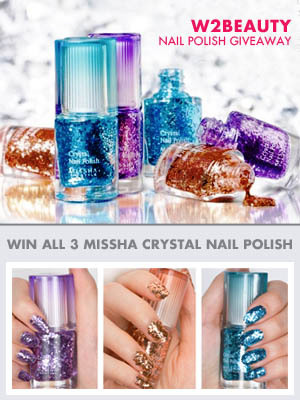 Missha Crystal Style Nail Polish giveaway. Looking to give your nails a sparkling and flashy touch? 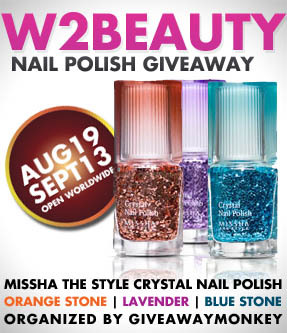 Then get to win these glamorous "MISSHA - Crystal Style Nail Polish" brought to us by Giveaway Monkey and W2Beauty. W2Beauty is an online Korean Beauty Shop offering a huge selection of different Korean brands and products for both men and women at a super reasonable price. Surely, they got all your needs covered from head to toe at a bargain price. Plus, they have this cool loyalty program where you can get rewards every time you buy an item. The reward is money - not points - that you can then convert into a gift voucher! Where else can you experience such thing - earning while shopping?! And to top that, they ship FREE worldwide! Visit their online shop to know more about their affordable products, awesome loyalty program, and great service! Alice from W2Beauty, is so nice to set aside not one but three (3) Missha Crystal Style Nail Polish (Orange Stone, Lavender, and Blue Stone) to give away for FREE to one of our lucky reader. That could be you! Join now to win these nail polish set by earning your entries via the rafflecopter form below. The more tasks you complete, the better your chances are. This giveaway is open international and will run until September 13, 2013. That is a lot of time to earn more entries through the daily tasks. The prize will be shipped by the sponsor straight to the winner, for FREE anywhere in the world. Have Fun! Disclaimer: I did not accept compensation for this event, nor we are responsible for the delivery of the prize. The prize will be shipped by the sponsor, W2Beauty straight to the winner. This giveaway is in no way administered, sponsored, endorsed by, or associated with, Facebook Twitter, Google, and/or Pinterest. Read full terms and condition in the rafflecopter form above.